If you want to learn how to surf call Kristin at Corey’s Wave or reserve online. Fitness instruction for all abilities will get you started and you can learn the basics at your favorite beach or perfect your skills in more challenging waters. Stand up Paddle Board instruction is also offered…a great way to get fit. Meet Montauk resident and hair stylist Christopher McCracken who brings a wealth of experience to our community. For the past 3 years, Chris has developed a devoted following of very satisfied clients here in Montauk and throughout the east end. A multi-talented Hairstylist, Make-up artist and Color specialist he has been cutting hair since he was 10 years old, doing make-up since age 13 and by 16 he was a licensed cosmetologist. And by 19 was working on Photo shoots. Some of his most recent professional experiences include providing hair and makeup styles for many local weddings, fundraising events, and photo shoots for print ads. Call for an appointment. Experience the world of Marrakech as you enter Deborah Thompson Day Spa, right in the heart of the Village at 37 The Plaza. “The greenest day spa in town,” is now specializing in natural and organic products! Be absorbed by the tranquil surroundings and lose yourself in an oasis of exotic scents and soothing sounds. It will be an unforgettable spa experience. They have the expertise to provide you with a wide array of unique services, including body treatments, facials, and massage. The Couples Room provides solitude and serenity for couples. Call for information and appointments. Salt therapy, or Halotherapy, clears toxins from our lungs and nasal passageways. The saturated air in the salt cave provides relief from many respiratory ailments, and also gives a sense of peace and serenity. The walls are built with all pink Himalayan salt rocks and the floor is covered with salt. Sessions are 45 minutes. Sit in a zero gravity chair, relax and breathe. They also offer Reiki, Sound Healing with crystal singing bowls, massages, and weekend events. A great gift shop as well. Open Thurs. through Tues. Closed Wed. Call for hours and appointments. Open all year. Elizabeth Willoughby began practicing Reflexology in 1987 in New York City. She currently practices and teaches exclusively in the Montauk area. Reflexology techniques stimulate reflex points in the hands, feet, & ears and allow the body to regain a balanced energy flow and an increase in blood circulation. These techniques create an excellent way to promote health, relieve stress, restore mental clarity and establish a sense of well-being. Flower Essences are a safe, gentle, and non-invasive form of vibrational healing that balance the negative aspects of your emotions, so that you can function and flourish emotionally, physically and spiritually. There is correcting Flower Essence for each unbalanced/negative emotion, to enliven and promote healing. Call for an appointment. 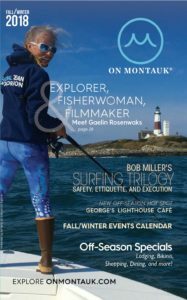 Robert and Maureen Jacob Bonavolta, owners of the Montauk Wellness Center, offer their services at the picturesque, serene Montauk Lake Club. From deeply relaxing treatments to clinical sessions, pre and post sports, to pain management and injuries. Ultrasonic and microcurrent skincare to expert brow styling, waxing and spray tanning. All facials and massages are personalized and per-formed by caring licensed professionals. Monthly specials and packages are available. By appointment in our office and home visits. Located in the village next to The Point restaurant, this medical practice provides comprehensive primary medical care for all ages. Affiliated with Southampton Hospital. Open from 9am–5pm Mon. through Fri.